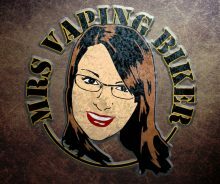 Hi there I am Vicky, Mrs Vaping Biker. 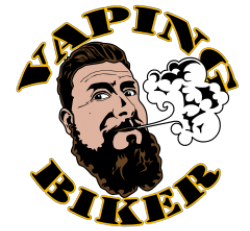 My lovely husband has convinced me to talk about my experiences within the vaping world from someone who enjoys a simple setup. I am a 40-45 watt women normally, prefer simple mods, use tanks as well as drippers and can do my own building. My go to mods are the Tesla Nano 60w and the joyetech VTC-mini because they are easy to operate, I like the size of them, particularly the VTC-mini as they fit in the little pockets of my handbag and just generally love them for that, but also the nano fits all the larger atomisers nicely. I’m female (edit from VB: I bloody hope so!) and as a woman I love to accessorise. What I liked about the my previous daily (the Innokin Disrupter) was the different coloured removable battery cells. I can match my innokin to my outfit (cue the eye roll), and in my day to day life I can charge it or a spare battery cell anywhere, at home, work or in the car. The newer cells with the curved edges make it nicer to hold, still without it being too heavy and they have taken away the “unfinished” look on the top, which I prefer. I traditionally find that the 2000mAH cells will last half a day each whereas the 3300mAH cell will go all day. For those days where I fancy a change the VTC gets picked up. It’s smaller and lighter than the innokin as it takes a single 18650. I like the feel of the finish on the metal and the curved edges makes it a comfortable in the hand. Batteries don’t take up much room (especially in a handbag when stored correctly with battery cases of course) and I can swap them out easily enough without fannying about. I love how cute it looks with my Troll dripper too. All three mods are nice and easy to use and if you are a beginner to vaping and want to step it up, these are nice options in my opinion. The tank of choice at the moment is the Wotofo Conqueror RTA. A pretty 4ml tank with a dual postless deck. I love the two windows that have been oddly placed but it works. A bit like my marriage! It’s different to look at, has plenty of airflow which is easily adjustable and provides a really good flavour on both the inhale and the exhale. It comes apart nice and easily when I need to change the wick or coils. I traditionally use this for the busy days so I don’t have to worry about running out of juice in the middle of a job or driving. I am also now loving the Serpent Mini 25mm from Wotofo, it has great juice capacity, and nice and easy to fill on the go. Now the troll dripper. Another Wotofo creation which also provides me with full flavour on the inhale and exhale. Pulls apart easily when it needs a clean-up and I love that the deck is easy to rebuild on. The air flow is adjustable with a simple twist and it’s easy to gage how open you have it. It’s nice and small, easy to carry as a spare when out and about. Drippers, in my opinion, will always give me a better flavour so when I treat myself to one of my fav juices, the troll comes out to play – although my dear husband is always getting me to try new drippers when he gets them in. Previous Post: What’s going on with lack of uploads Dean??? After reading your blog, I have a feel of your personality, albeit a small one, but the two of you seem a perfectly lovely couple. Dean is always pleasant and great fun to watch, and being American and of 100 percent Irish descent myself (I hope you’ll not hold that against me), hearing the sound of his accent and proper grammar is always a welcome change from the way a vast majority of Americans butcher the King’s in this century. I always look forward to his “Come on then!” when he dives down to review a product. The comprehensiveness of his reviews should not be overlooked, either. But this is about you… I loved your blog and hope to see more of them in the near future. You’re a treat to read, and obviously I’m still awake. You have a very likeable quality and I could’ve kept reading; I thought it ended too soon. A genuine lady’s take on any given subject is always refreshing, and you write very well – something too many take for granted these days (especially Americans). I understand your love of tanks, as I just started dripping last week after vaping sub-ohm tanks for better than three years. They’re very convenient and easy to use, but where we differ is the size. I always used the biggest, cloud-chuckingest (new word for the dictionary) tanks that Smok could churn out, most recently the TFV12 Cloud Beast King. As a gentleman, stowing them in the back pocket was always easy and I still plan to use them when out and about, but the flavour produced by high-quality RDAs cannot be matched. I am now the proud owner of a Goon V1.5 with a dual coil build of pre-made staple staggered fused claptons, and could not be happier. The clouds, and most importantly the flavour, with this combination is mind-blowing. Next on the agenda is building my own coils. I ordered and received all the tools this week and am about to begin my first attempt at a more complicated build. (I suppose YOU’RE asleep now). Keep the blogs coming, Mrs.VB! You’re a joy to read and I’m very much looking forward to them! Hi Vicky. I have similar setups to you plus some additional stuff. I think it is good to have some reviews from a female perspective as I find a lot of mods and tanks are definitely geared towards the men or women with very large hands LOL. Look forward to more reviews from you. Thanks for the recommendation of the lemonade stand at the expo, after a week of trying them, two firm favourites have shown up. first the Tropical lemonade ‘Peachy’ followed closely by the mojito lemonade. Thanks for your comment. As for your wifey I think the best foot forward would be to visit a quality vape shop that will let her try flavours out. She can then establish if she likes fruit flavours, desserts, sweets or drinks and fingers crossed she can find something she loves and will want to vape. I really hope this helps for the moment. But keep reading as I will be talking about juices in the coming weeks. Fantastic write up! Great details, trying to get my wifey on the vape but to no avail so far. She loves the flavours and smells in the house but is a bit jubious of the flavours and not liking them, I was the same at the start mind, all I would vape was menthol but now I’m vaping all sorts of crazy concoctions. Any advice for (starter) flavours for her would be great.